"This one is finger-licking good! It's a keeper and a must try!" Sprinkle the chicken pieces with salt and pepper, and place them in a deep-sided baking dish. Whisk together the buttermilk, hot pepper sauce, and 1 teaspoon of cayenne pepper in a bowl. Pour the mixture over the chicken, stir to coat all sides of the chicken pieces, and cover the dish with plastic wrap. Refrigerate for about 2 hours to marinate. Remove the chicken pieces from the buttermilk mixture, and shake off excess. Discard the remaining buttermilk mixture. Place the flour, 1 tablespoon of cayenne pepper, garlic powder, paprika, and salt and pepper to taste in a large plastic zipper bag, and shake well to combine. Place 2 or 3 pieces of chicken at a time into the plastic bag, and shake well to coat the chicken pieces with seasoned flour. Heat oil in a deep-fryer or large saucepan to 350 degrees F (175 degrees C). Gently place chicken pieces into the hot oil, and fry until chicken is cooked through and golden brown, 8-10 minutes (breasts and wings) or 13 to 15 minutes (thighs and drumsticks). 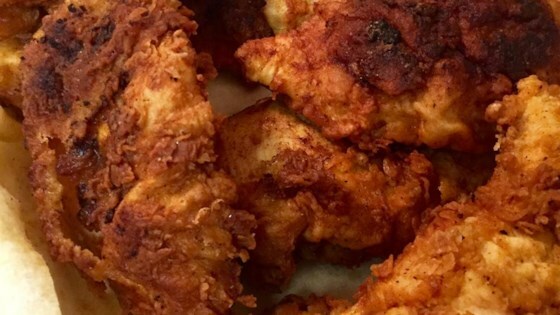 Drain the fried chicken on paper towels. Watch how to make this top-rated classic. I didn't like this recipe at all, but my husband did. I love spicy southern fried chicken, but this just didn't taste right to me. This was really good. I soaked the chicken in buttermilk overnight. It didn't seem spicy to me, but it crusted nicely and was very good. This sounds great and I will try it some day but I will cut the recipe down to 4-6 servings. Excellent! It's a keeper. I'll be making this on a regular basis. This was a good recipe.